Robbie Williams' wife Ayda Field gave birth just four months ago. But the stunning Turkish-American actress looked in better shape than ever when the couple were spotted enjoying a date night on Friday. 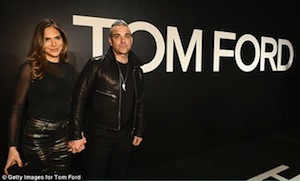 The pair took a rare evening off from parenting duties yesterday to spend some quality time together at the Tom Ford Autumn/Winter 2015 Womenswear Collection Presentation. Proving their relationship is more solid than ever following the birth of their second child Charlton Valentine in October, the couple proudly put on a series of PDAs when they took to the red carpet. The pair, who exchanged vows back in August 2010, were spotted holding hands, wrapping their arms around one another and even sharing a tender kiss at one point. At the lavish bash, Ayda looked incredible in a pair of skintight shimmering metallic trousers, which featured a flair cut. Highlighting her trim waistline, she teamed the piece with a sheer, black long-sleeved top, which she tucked into her trousers. Meanwhile, Robbie also looked pretty dapper in all-black number consisting of jeans, a plain tee and leather jacket. I love my wife’s company. She gives me a lot of energy – she’s like a one-woman cheerleading team. Ayda and Robbie, who are also proud parents to daughter Theodora Rose, will celebrate five years of marriage in August.